[02:42:23] <CanSir> Jepler - are you out there? [13:53:50] <jepler_> cradek: did you look in the menu to see if you turned them off? [13:54:12] <jepler_> cradek: what config? [14:11:44] <SWPadnos> hola Stuart, como esta? [14:13:52] <stuste1> is there a way to insert 'net' commands in the pyvcp '.xml' files? [14:20:16] <stuste1> how are you doing that? [14:29:26] <jepler_> stuste1: so you want emc but none of the traditional GUIs? [14:37:10] <archivist_ub> * archivist_ub searches for a gcode, "ask the user for a number"
[14:48:07] <jepler_> stuste1: with this change to emc.in (re-'make' after changing it), you can specify a pyvcp .xml file as your [DISPLAY]DISPLAY, and after the control panel is created, the hal file specified by [HAL]POSTGUI_HALFILE will be evaluated so you can create connections to the vcp. [14:48:28] <jepler_> I made the change in TRUNK, I'm not sure if the patch will apply to 2.2..
[15:12:40] <SWPadnos> for example, I want 27 teeth, but I typo 278 - what happens? [15:25:22] <SWPadnos> using Y and A movements? [15:31:44] <SWPadnos> heh, disclaimer at the bottom of a web merchant product page: "We do not recommend you make puchasing decisions based on Forum messages." [15:55:54] <skunkworks_> reminds me of a dilbert cartoon.. techno bill! [15:56:13] <cradek> the guy with no cnc machine has the best toys of anybody? I don't think so. [17:21:14] <stuste1> jepler: if I 'cvs up -Pd' trunk I will get the changes? [18:09:02] <stuste1> Can I just edit it into the emc.in file? [18:24:56] <SkinnYPup> Need one of these then toast ! [18:26:59] <skunkworks_> I don't really think I want the gas tank between my legs..
[20:19:35] <SWPadnos> but it's for labor! [20:29:51] <BigJohnT> over the counter? [21:17:29] <Guest370> can I use more than one parallel port for I/O with EMC2? [21:18:02] <Guest370> nice, and i configure multiple ports with HAL? [21:21:07] <Guest370> I just got my z-axis stepper in place on my lathe and wited in to my controller lastnight....so was finally able to test my setup with EMC2 , motor is direct coupled to the leadscrew(16tpi) . 1/1 for no microstepping on my driver board...but when i tell it to move 1" it moves 1 7/8 " .... any ideas as to what i am not setting right? [21:22:08] <alex_joni> Guest370: what's your SCALE ? [21:22:27] <alex_joni> is it a 200 step motor? [21:23:30] <Guest370> i left the software microstepping setting in stepconf at 2...? [21:23:30] <alex_joni> so scale is 3200 ? [21:23:58] <Guest370> ahhh, does leaving it at 2 mean i am telling it half stepping? [21:25:05] <BeIdentityCrisis> High all. Anyone know if it's possible to increase the range of the feed override in Axis? [21:25:24] <alex_joni> guess you want to know how? [21:25:50] <antichip> isn't knowing it's possible enough? [21:27:08] <alex_joni> BigJohnT: not in there? [21:30:59] <antichip> I'm hanging on the fence to buy a few of the new geko drives, I should also get a mesa I/o card while I actually have recources for it. [21:31:16] <SWPadnos> stepper or servo drives? [21:34:58] <antichip> that is just the motor? [21:35:04] <BigJohnT> antichip: have you seen the new gecko stepper drives? [21:35:23] <antichip> motors are free to me or free enough, drivers are a comodity though. [21:38:34] <antichip> yay the 8 dollars is worth not sourcing mica or other insulator. [21:39:54] <antichip> my linistepper KIT was almost that much how can I go wrong? [21:42:32] <antichip> I have linear encoder strip at 360 lines per inch. Does thes equate to 7 tenths resolution? [21:42:35] <jepler_> cradek: that stepper-mpg runs off a single +5V supply and has differential quadrature output. when energized, it's 50 detents per revolution. If you move slowly enough, it will drop quadrature edges. [21:44:26] <antichip> how slow is slow to loose edges? [21:47:11] <tomp> winter wonderland? flycutting plastic? [21:48:45] <tomp> some kinda jig? [21:49:06] <antichip> thats not as bad as I was thinking. can you tune the "stiffness" by adjusting the current to the stepper? 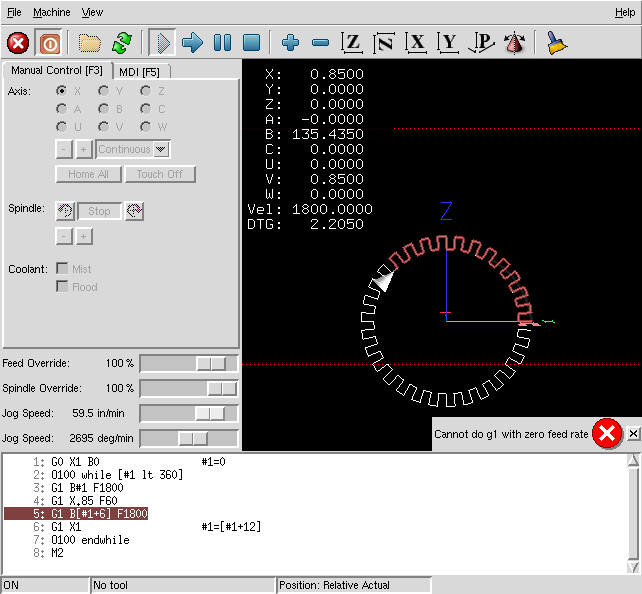 [22:43:30] <jepler_> still, with detents and a knob it's a better jogwheel/shuttle than my servo motor..
[22:50:05] <MASEngr> If I'm testing the PID tuning parameters, what pins should I be looking at in Halscope? I'm not seeing a change when I change the parameters. [22:51:11] <MASEngr> I'm looking at Xoutput, Xpos-fb, halui.axis.0.pos-commanded, and axis.0.joint-pos-fb. [22:51:35] <MASEngr> But it's not making much sense. If P is 1, 10, or 100, the graph is the same. [22:53:55] <jepler> what are you using to vary the PID parameters? [22:54:13] <jepler> halcmd? calibration? or some other method? [22:55:44] <MASEngr> What should I be using to vary the parameters? I was editing the .ini file and restarting the program. [22:57:21] <MASEngr> From the way you asked that question, it sounds like I'm doing it wrong / the hard way. [22:58:36] <MASEngr> I am using axis, I didn't know that was there. [22:58:37] <jepler> enter the values you want to try, then choose 'test'. Now do whatever it is you do to test the response -- for instance, mdi a G0 move and look at it in halscope. If you like the tuning better now, click "OK", otherwise click "Cancel". [23:01:18] <MASEngr> I don't know what that last two sentences meant, but I can see the change now in PID.0.error. [23:02:06] <MASEngr> Indeed it did. [23:02:24] <MASEngr> While I'm here, I have two other questions. [23:02:58] <MASEngr> First, is there an easy way to change the size of the coordinates in axis? I tried the axis_big_ngo method and it didn't work. [23:03:26] <MASEngr> And the second question was answered in my head before I asked it, so never mind. [23:06:47] <willburrrr2003> if i add an encoder to one of my steppers' axis , how do i set it up to operate? [23:16:53] <skunkworks> MASEngr: if I remember correctly - your machine has scales and a little backlash... that is really going to be a pain to tune. [23:18:38] <willburrrr2003> now as far as setting up and encoder...would you set it up on the leadscrew , or set it up to read actual travel of the axis (so not reading the backlash from the leadscrew) ? [23:19:51] <dmess> if you have scales why do you need an ancoder?? [23:20:27] <willburrrr2003> i do not have scales? [23:21:38] <MASEngr> skunkworks: Yes, it's a pain to tune, but it's clearly wrong. I've managed to improve it quite a bit already, since I got the clarification. [23:22:15] <MASEngr> Anyway, I've got to leave. Thanks again, everyone. [23:26:19] <willburrrr2003> makes sense... that would acount for backlash from my homemade coupling, but would it account for any backlash if it is present between the cross-slide and the leadscrew? [23:26:43] <willburrrr2003> indicator travel.... the little one for manual threading? [23:29:17] <willburrrr2003> ok so with an encoder, emc will not correct the travel if i tell it to move an inch but backlash only lets it move say 7/8"
[23:30:54] <dmess> any one ever heard of DIXI boring mills?? [23:33:11] <willburrrr2003> ok, how do i do that? [23:35:00] <willburrrr2003> i could always preload the axis to prevent the backlash...? [23:37:06] <dushantch> fenn: so if your axis rattles around because of backslash, how does EMC compensates? [23:37:41] <dushantch> is it plain adding to backslash direction or what? [23:40:15] <toastatwork> how much accuracy do you need that stick-slip has become an issue in your machine? [23:44:12] <dmess> plain slides = box ways?? [23:47:07] <dushantch> how do you call when radial forces are on diferent slides on one axis? [23:47:58] <dmess> what coolant/ lubricant you using?? [23:49:58] <toastatwork> i hope so, they're .180"
[23:51:32] <dmess> just broke at the shak?? [23:54:37] <toastatwork> someone piss in your cornflakes? [23:55:13] <dmess> are you insinuating something?? [23:59:31] <dushantch> dunno, I watched some machining power diagrams, and they rise pretty sharply after tool gets dull.